Welcome back to our series about making vet trips less stressful for your pets! In part one, we talked about how to acclimate your cats to vet trips, and in this blog post, we’ll be focusing on dogs! While dogs handle vet trips much better than cats do in certain ways, they still experience their fair share of stressors, and there are always things you can do to make the experience more agreeable for them. This one may sound counterproductive, since a fed dog is a happy dog, but hear us out! By not feeding your dog beforehand, they will be much more receptive to treats. And treats, of course, are basically the magic ingredient in conditioning dogs. If you’ve ever trained your pup, you’ll know just how useful treats are in getting them to learn obedience. But even if you’re not doing any training, treats still go a long way into making a dog happy and content. If they’re hungry beforehand, you and the veterinarian will be able to use treats to great effect. Dogs tend to form attachments to certain toys, so bringing one that they really love can help to ease their anxiety. Luckily, the car ride to the vet is much less stressful to dogs than cats, since most dogs already enjoy riding in the car and going on adventures with their owners. But, if you pack a toy for them, it will help them to feel less nervous when they’re actually at the veterinary clinic. Dogs often get uneasy once they’re at the clinic. Call it what you will, but they almost have a supernatural sense of knowing when they’re about to go in for treatment, so having a little piece of home with them at the veterinary office will help, if ever so slightly! Did you know that dogs are cognizant of music, and have been known to show positive reactions to it in various studies? As it turns out, soothing music has the same calming effects on dogs as it does on humans. If you play music for your dog before a stressful event, it can actually help them feel more at ease! If you’re unsure of whether your dog would be more inclined towards Mozart or Bach, you can make things easier on yourself by shopping for music made specifically for dogs. This is a safe choice, given that the music is specifically designed to appeal to canine ears. 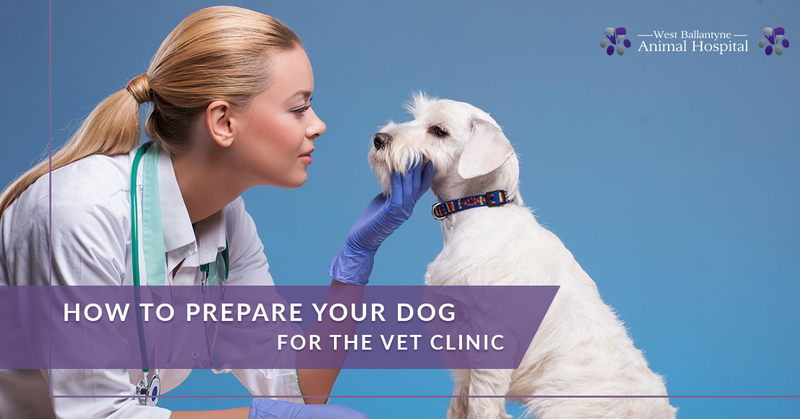 The last thing you can do to make the visit more agreeable for your pup is to talk to your veterinary technician beforehand. Different dogs have different personalities, and if your vet is able to appeal to that personality, things will go more smoothly — for both the dog and the vet. At West Ballantyne Animal Hospital, our veterinarians have been handling pets in the greater Charlotte area for years, and our singular goal is to help provide a happier, healthier, and longer life for your pets. Do you need to take your canine friend in for dog care services? Stop by today, and be sure to contact us if you have any questions!